A covered porch topped with dormers gives this home classic appeal. The bonus room adds 410 square feet. The two-story great-room, overlooked by a balcony, features built-ins, a wall of windows, and a fireplace. In the main-level right wing, twin walk-in closets and a luxurious bath embellish the master suite. The counter space in the kitchen is a food preparer’s dream, while the direct access to the eating bar, breakfast room, and formal dining area will please the server. On the upper level, bedrooms, each with a window seat and ample closet space, share a hall bath and computer center. This home is designed with slab and crawlspace foundation options. For a smaller version of this plan, see 61166 or 62134. Question: Does the basement plan cover the same sq. ft. as the main house without the porches? Answer: Yes, the available basement area is directly below the heated/cooled main floor space. Our basement walls are 8 inches thick so it is reduced around the perimeter due to the 2x4 vs 8 inch basement walls. Answer: Yes. The basement option is $250. Question: Resending: Need a plan similar to this with approx. 2400 sq ft. Or, need to cut some area out of second floor. 790 seems like more than what is shown? What exactly is the area of each 2nd floor room? Question: Can you tell me the size of the 2nd floor bathroom and pantry? Is the back porch ceiling vaulted? 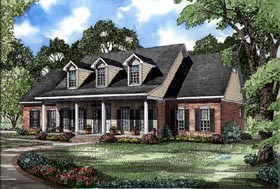 Answer: Please see plan 61166, sq ft 1783 – builder can side load garage on site.